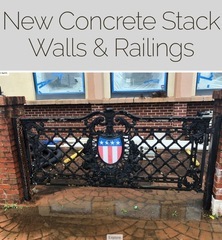 M21915 Contractor is liquidating new stackwalll inventory and decorative American themed railing. AUCTION CLOSING DATE: Monday, November 12th at 11:37am. Bidding closes on the first item at 11:37 am, then closes at the rate discussed in these Terms and Conditions of Sale.